George Baugh has been the Senior Minister at Rushville Christian church since March 1, 2012. He moved to Rushville from Iowa along with his wife, Amy and their two daughters, Marissa and Savanah. 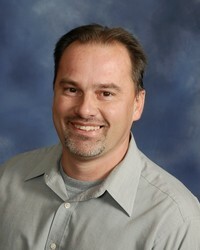 George is originally from Centerville, Iowa where he graduated from high school in 1989. He attended community college for two years and planned on pursuing an Elementary Education degree. Wanting to solidify his foundation for his Christian life before continuing his pursuit of a teaching degree, George decided to attend one year of Bibe College at Midwestern School of Evangelism in Ottumwa, Iowa. Once there, he couldn't imagine himself doing anything other than ministry.He studied there for four years, receiving a Bachelor of Sacred Literature degree, Bachelor of Theology degree and Master of Sacred Literature degree. While in Bible College, George was a student preacher at Abingdon Church of Christ for two years and youth minister at The Church at 4th and Washington for two years. After graduating in 1995, George and Amy were married and moved to Sidney, Ohio where he was the associate minister. After a year and a half, George was asked to move to Davenport, Iowa where he served as the preaching minister at the Davenport Church of Christ. After five and a half years at Davenport, George and his family moved to Ethel, Missouri, where he was the preaching minister for seven years. Feeling a strong desire to go into youth ministry, George and his family moved to Pleasantville, Iowa and served as youth minister there for three years. Finally, in March of 2012 George and his family moved back to the state of Missouri to become the senior minister at the Rushville Christian church. Along with serving at the church, George is also active in the community in athletics - whether coaching, officiating, playing or simply as a fan. George also spends some time at the local school as a substitute teacher. George's hobbies include collecting sports cards, playing disc golf and basketball. George also loves to spend time with his family, go on dates with his beautiful wife Amy and root for his favorite sports teams - Iowa State Cyclones, Pittsburgh Pirates and Pittsburgh Steelers. Feel free to contact George at the church office, by the email listed above or on Facebook.